Please note the image scans displayed in this original report are the first that were obtained (July 1998) and are not of high quality. To view the best images please click here for scans that were obtained in May of 1999. As a result of some local publicity in May and June of 1998, we were informed that a photograph of several UFOs near Tagish Lake was taken some years back. In July of 1998 an investigation led to the identification of the secondhand witness who was in possession of a slide duplicate of the image. A copy of the slide was made, a preliminary analysis performed, the witness was interviewed and results are presented in this report. A cropped portion of the image is shown below (Figure 1). An image of the entire slide (112K) is also available. There are seven UFOs in the image. We know that there was a total of seven objects from witness testimony. This is important since object 7 (the smallest object) is almost indistinguishable from bright reflections off the mountain rocks. The UFOs in Figure 1 are numbered 1 through 7 at the upper and lower edge of the image as not to distract from the photo. Each one is "clickable" for a magnified view of each object. Figure 1. 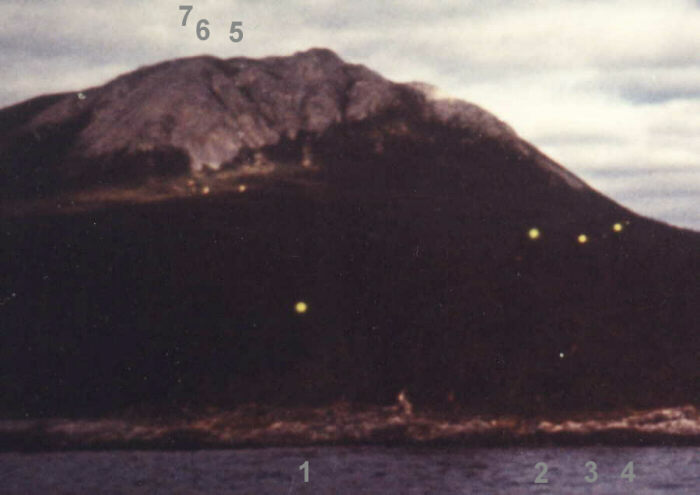 Cropped image of seven UFOs near Tagish Lake, Yukon Territory Canada (1970, approx.). There are four yellowish UFOs in the forefront and three amber color UFOs up on the mountainside. The small irregular shaped specs are dust particles which could not be removed at the time the copy negative of the slide was being made. A closer look at UFOs #2, 3, and 4 is shown below in Figure 2. Each UFO is once again "clickable" for a more detailed view. Figure 2. UFOs #2, 3, and 4. Note that there are three other anomalous objects or lights surrounding UFO #4. Two couples were doing some recreational boating on Tagish Lake in 1970 (approx.). Tagish Lake is a large glacial lake about 100km(60 miles) south of Whitehorse, the Territorys capital. The two couples were travelling in two separate boats. To respect their anonymity, we will simply refer to the two men involved in this story by their first names, Jim and George. George was in his early 50s and Jim was in his mid 60s around that time. Note: since the writing of this report, Jim's surviving daughter has been contacted. She has given her permission to disclose his identity. You may read about Jim Conacher here. It was about 10 am when they were travelling southbound on the lake. It was windy and the water was a bit on the rough side. Jim's boat was smaller than George's and also had an open top. George and his wife where driving in a closed and larger boat. Because Jim had a smaller boat and wanted to stay out of the roughest water, he was travelling close to the shoreline while George and his wife could afford to travel out in the middle of the lake and were about 5 to 8 kilometres back. While travelling along the edge of the lake, Jim and his wife saw seven strange glowing orbs as shown in the photograph (Figure 1). There are four closer objects and three more further up the mountainside. Jim estimated that they were 3 to 4 feet in diameter. They moved about slowly for the estimated 15 minutes that they watched them as he and his wife traveled down the lake. The four closer objects eventually made their way up the mountain to join the other objects. George was too far back to notice the objects and didnt even have sight of Jim's boat. His concentration was devoted to the rough water. Jim or his wife never mentioned anything to George until the film was developed, about a week later. We can speculate that this may have been because of the fear of ridicule or disbelief. That is until Jim had the slide in hand. As far as George knows this was the only photo of the objects that Jim took. Jim used slide film and made a couple of slide duplicates for George . George submitted one to the Weather Office who submitted it the Department of National Defence in Ottawa. About a year later George was curious to find out what the department found from their analysis so he asked the person at the Weather Office to look into it. The answer he got back was that that information was classified. The analysis performed here does not come from experience in analyzing UFO photographs but rather from the viewpoint of experience with photography. Further analysis is warranted by experts in the UFO field. On Sept 5, 1998 a field trip was undertaken to establish a more precise location of the sighting and the location of Jim when he took the photo. After some effort the location was found and a 1998 photograph was taken from the same spot using a camera with the same focal length lens as Jim used. The UFO locations were drawn as red circles to facilitate analysis. The island in the forefront enabled us to pinpoint the witness location on a map of the area (105K). It is estimated that the 1998 photo was taken within about 10 metres (30 ft) of the 1970 photo. Unlike the 1970 photo which was taken under cloudy conditions the 1998 photograph was taken in good lighting and therefore shows a lot more detail in the terrain. The photograph was taken at about 9:45am, about the same time of day as the 1970 photo. Because of the higher detail some further analysis could be performed. By measuring rock formations on the island and scaling them on the photograph it was established that Jim was approximately 50 metres (164 ft) from the island. The distance of 250 metres (820 ft) from the island to the shore behind it was scaled off a map. Therefore, the total distance from Jim to the shoreline was approximately 300 metres (984 ft). The 1998 photograph clearly shows that UFO#1 was in front of the tall spruce trees at the shore line. If we assume that UFO#1 is just in front of the trees and therefore 300 metres from Jim, we can calculate its size. After doing the math we get a maximum object diameter of 1.4 metres (4.5 ft). This agrees well with Jim's estimate that the objects were about 3 to 4 ft in diameter. Although the objects look like dots in Figure 1, calculations show that UFO#1 would of appeared to be about half the diameter of a full moon to the witnesses. The magnified images: UFO#1, UFO#2, UFO#3, UFO#4, UFO#5, UFO#6, UFO#7 are magnified to the point where the grain structure of the film can be seen. This should be taken into account when looking for details in these images. Nevertheless, useful data can be obtained from these magnified images. The objects appear slightly hazy or diffused. However, note that there is no sharp detail in the entire photo so it is therefore not possible to tell if the actual objects were well defined spheres or diffused lights. (Figure 2 shows that the edge of the mountainside is not any less diffused than the UFOs). Of notable interest is UFO #4. It is surrounded by 3 anomalous bluish objects or lights. These magnified images can give us the relative diameter and color of the UFOs. The diameter was used to assess object size and distance. The color of the objects also give us some important information. This color difference is dramatically shown in a close-up seven object composite portrait. Note that UFOs 1 through 4 (the closest ones to the camera) are not in direct sunlight as the surrounding trees are not illuminated. Therefore, these objects may be glowing by their own source. The glow is of yellow and perhaps of a slightly green color. In contrast, the area around UFOs 5, 6, and 7 up on the mountainside is bathed in morning amber light from the sunrise. The three UFOs also seem to be of a similar amber color suggesting that they may be reflecting sunlight as well. If this is true, it indicates that they are of a solid nature rather than some form of plasma. The questions remains; if the 4 closer objects were exposed to the sunlight, would they also reflect it over and above their glowing yellow color? Did they appear to be of the same amber color to Jim once he observed the 4 closer objects join the other objects further up on the mountainside? If we do this for UFO#5 which appears to be further up the mountainside where the sun appears to be shining, we obtain a distance of 1.15 kilometres. However, this is inconsistent with the actual distance of about 5 kilometres to this location (see map of area). One way this can be explained is if the objects on the mountainside are larger than UFO#1. If we do the calculation, UFOs #5 and 6 would have to be at least 6 metres (20 ft) in diameter. UFO# 7 appears to be much smaller in the photo and may be partially obscured by trees. The possible locations of the seven objects are shown as small red dots in a map of the area. The complete image (112K) shows useful information which will aid in further analysis. Several dust particles and the frayed edge of the slide can be used to assess the quality of the copy negative and print. Ideally we want the grain structure of the copy film finer than the structure of the slide to capture the most detail. This is likely the case as films today have a much finer grain structure than in 1970. Nevertheless, this can be independently assessed by looking at the film grain size representing the dust particles. The print will have to be enlarged further and rescanned for this analysis to be performed. The complete image (112K) is not of a fine enough resolution for analyzing the film grain structure. It would be ideal to work with the original slide to perform further analysis. It would also be of great value if other photographs of the objects were taken. Perhaps one after the four UFOs in the forefront moved further up the mountain. Unfortunately, Jim has moved down south and has since passed away. His wife is also deceased. Attempts will be made to recover the original slide by contacting surviving relatives. George stills resides in Whitehorse. A careful look at the film grain structure representing the dust particles on the slide will be compared to the grain size representing the UFOs to assess if the copy negative was of a fine enough grain size to record as much detail as possible from the slide. The testimony of the secondhand witness George sounded very sincere. George was curious about what Jim saw and photographed and added that neither him nor Jim have or have had a big interest in the UFO phenomenon. There was no apparent reason for Jim to make up the story or to fake the photograph. Jims story which was related by George sounded sincere and the two were close friends. Jim was the Chief Grain Inspector of Canada around that time and therefore it is unlikely he would have risked his credibility by perpetuating a hoax. One question which often comes up is "Why is there only one photo of the objects when Jim observed them for 15 minutes?" Of course there may have been more photos that we are not aware of but as far as George knows, Jim only had the one image. However, during the September 1998 field trip, one possible explanation for the one photo theory came to mind. As I was holding up the UFO photo in front of me, looking at the scene, and simultaneously trying to steer the outboard motor to get into Jim's position, one thing very quickly became apparent. When I imagined what the real scene must of looked like, it almost sent chills down my spine. Although, UFO#1 looks only like a dot in the photograph, UFO#1 would of looked " DAM CLOSE ! " in real life. If Jim wanted to at the time he could of driven the boat towards the UFO and been underneath it in less than 30 seconds and taken more photographs at very close range. Surrounded by ice cold water it wouldnt surprise me if he would have chosen to do just the opposite; that is, take one quick photo and continue to drive down the lake while keeping a somewhat fearful and very watchful eye on the objects. It is unknown what brand and model of camera was used to take the original image. However, George thinks it was a good quality camera, perhaps a Leica. The film format was 35mm. George surmises that Jim may have been using 25 ASA slide film at the time. The September 5th, 1998 field trip established that the lens focal length was a standard 50mm. Fuji 100ASA print film was used to make a copy of the slide. A copy stand and a 35 mm Cannon SLR Camera (EOS 630) was used to take negative copies. A 100 mm (true Macro Lens) was used, magnification was 1:1. The slide was backlit using Tungsten photo lamps with a blue corrective filter over the lens to compensate for use with daylight film. Aperture was set at f9.5. Shutter speeds were bracketed and ranged from 1/4 to 3 seconds. A timer was used to reduce camera shake. Glossy prints measuring 4x6 inches were made of the entire image (these would be approximately 4 times magnification of the slide). Twenty times magnified 5x8 inch prints of the UFOs were also made. The prints were scanned using a UMAX 1220S Scanner ranging from 150 to 1200 dpi. To reduce download times, the images on this web site are not the full resolution scans.